Why Aptitude Mixtures and Allegations is Required? In this Aptitude section you can learn and practice Aptitude Questions with Answers based on "Mixtures and Allegations" to improve your skills in order to face written test by IT companies, interview and various entrance tests like Bank Exams, Railway Exams, ICET, GATE, CAT, GRE, MAT, etc. Where can I get Aptitude Mixtures and Allegations Questions and Answers with Explanation? AllIndiaExams provides you lots of fully solved Aptitude Mixtures and Allegations questions and answers with explanation. Fully solved examples with detailed answer description. All students, freshers can download Aptitude quiz questions with answers as PDF files and eBooks. Where can I get objective type, multiple choice Aptitude Mixtures and Allegations Interview Questions and Answers? How to solve these Aptitude Mixtures and Allegations problems? You no need to worry, we have given lots of solved Aptitude Mixtures and Allegations questions with detailed explanation and also we have provided lots of short cut methods to quickly solve the questions within short time. So you can easily solve all kind of questions. This is aptitude questions and answers section on Mixtures and Allegations with the explanation for various interview quiz, competitive examinations, and entrance tests. At present, we are discussing the Mixtures and Allegations Aptitude Questions for the participants who are preparing for the Mixtures and Allegations Online Test. As we all know that, the difficulty level of the Mixtures and Allegations MCQ questions will ask in the exams. And in the recent times, it usually ranges from the moderate to difficult level and also definitely it doesn’t fall in the easier category. So people practice is the only way which could save the candidates from the Mixtures and Allegations Online Test. Most of the people will have the various type of questions regarding the exams, and they would also have the confusing question of how to solve the questions. For those contenders in learning series, our team is posting all the types of questions asked in Mixture and Allegation Online Test. And we are describing every topic of Mixture and Allegation Quiz with an example and shortcut method to solve the problem from the basic level. So aspirant let us attempt Mixture and Allegation Quiz by getting down to this post. Individuals those who are eagerly waiting to take Mixtures and Allegations Quiz can check this post entirely. In this web page, students can practice all the topics which are going to cover in the Mixtures and Allegations quiz. Also, we have provided some frequently asked questions that are available in the below sections. So, before attending the Mixtures and Allegations MCQ Online Test aspirants can go throughout this article. People have to practice the Mixtures and Allegations online test to learn as much as required. We advise all the students to take Mixtures and Allegations MCQ Online Test to improve your skills and to know more other details. So, before practicing the Mixtures and Allegations Online Test, candidates can check the overview of this article. The quiz is composed of 23 questions. There is no time limit to finish the exam. Also, this is a Mixtures and Allegations MCQ Online Test test where the pattern is in the form of Multiple Choice Questions. After marking the every question applicants have to click on View Answer button. Then they can see the answer with the detailed explanation. We advise all the aspirants to keep on visiting this article for more updates and stick to our blog allindiaexams.in. 1. A mixture of 150 liters of wine and water contains 20% water. How much more water should be added so that water becomes 25% of the new mixture? 2. A vessel contains 20 liters of a mixture of milk and water in the ratio 3:2. 10 liters of the mixture are removed and replaced with an equal quantity of pure milk. If the process is repeated once more, find the ratio of milk and water in the final mixture obtained? 3. In what ratio should two varieties of sugar of Rs.18 per kg and Rs.24 kg be mixed together to get a mixture whose cost is Rs.20 per kg? 4. How many liters of oil at Rs.40 per liter should be mixed with 240 liters of a second variety of oil at Rs.60 per liter so as to get a mixture whose cost is Rs.52 per liter? 5. Two varieties of wheat - A and B costing Rs. 9 per kg and Rs. 15 per kg were mixed in the ratio 3 : 7. 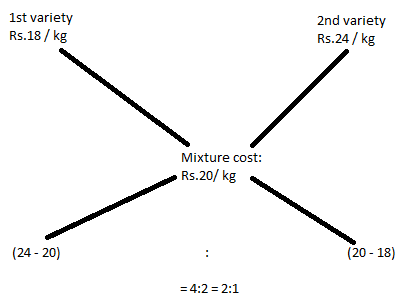 If 5 kg of the mixture is sold at 25% profit, find the profit made?